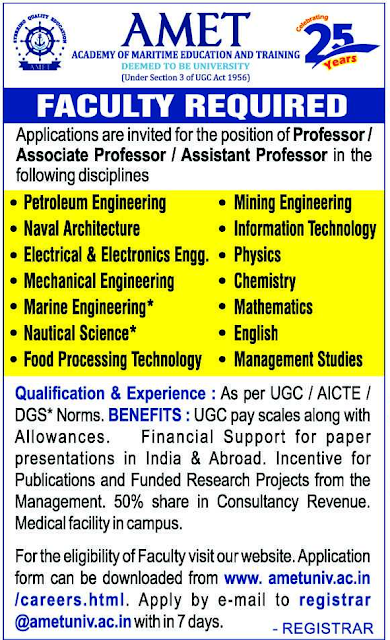 AMET University, Chennai has advertised in THE HINDU newspaper for recruitment of Professor / Associate Professor / Assistant Professor jobs vacancies. 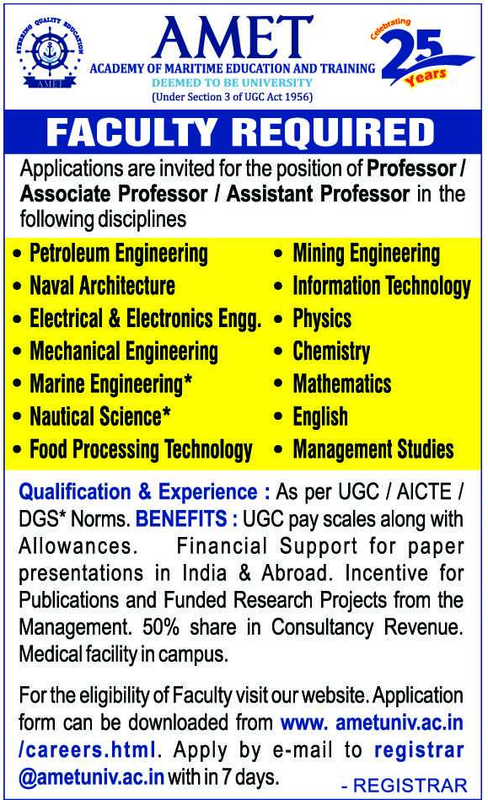 Interested and eligible job aspirants are requested to apply within 07 days from 10th April 2019. Check out further more details below. About University : With quality, commitment, knowledge and excellence as its corner stones, AMET had a humble beginning in the year 1993 with just 14 cadets molded for a career in merchant navy through a Higher National Diploma programme in marine engineering. AMET’s uncompromising strides of excellence in the field of maritime education and training laced with its capacity to feed the global shipping industry with an unrivalled maritime human resource secured it the status of becoming the first Deemed to be University in India for maritime education, training, research and development activities on the 21st August 2007. How to Apply: Interested and eligible candidates are requested to download the application and API forms from university website and E-mail the filled in forms to the email address mentioned below.